I am a huge procrastinator. I've been redoing a kitchen table since October and I'm no where near being finished. I put things off forever thinking I have plenty of time to do it all. Then all of a sudden my time is closing in on me and and I have nothing done. 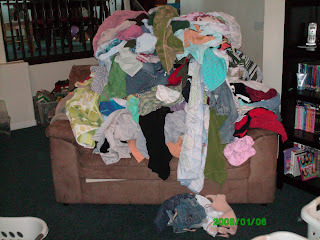 Here's my laundry I should be doing. I spent 30 minutes looking for the camera to take a picture of this. I guess I'm a time waster too. I need to get started with the laundry so I can start packing for my Sis's wedding. I'm pretty good at packing but I'm no good at laundry. Instead I have the great urge to update my blog. Because as we all know this is so much more important then cleaning or packing. I have about 20 things I have put off thinking I had plenty of time but I forgot tomorrow is a holiday and Bob is home (why does that make my work harder?). The kids want to go to the pool again but only to get a tiger's blood frazil not really for the swimming. How come I feel like I should take them? We've been 3 full days this week and will most likely drag Bob there tomorrow. So, instead we'll stay home and I'll put them outside to ride bikes or run through a sprinkler because I have way too much stuff that I let pile up and now I have to pay the price. When did life get so hard? I want a tiger's blood too. Oh well. Off to fold the laundry.